Starting in the photography business (in 1981) using the film medium, I have since made the transition to digital capture. While no job is too small or too large, I am pleased to provide my clients with the honest and reliable experience they need. Prompt and affordable photography services that best represents you, your company and your products in the best way possible. My first experience in photography came at a young age while in the sport of surfing. But it wasn’t until 1981 that I turned professional. A native Californian, I have since earned several awards for professional photography and photojournalism. My images have been published around the world in hundreds of publications. In addition to photography, I have written three books and enjoy many outdoor activities. My first exposure to drag racing came at Lions Drag Strip in Wilmington, California, around 1964. I later raced a 1955 Chevy at OCIR, Orange County International Raceway, in Irvine, California. Raised in a power-boat family who spent nearly every summer water-skiing, it seemed almost second-nature to take interest in drag boat racing. And so in 1981, I did turn to the exciting sport and became deeply involved. 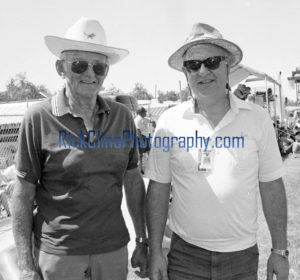 Above: With the late drag boat photographer Jack Cool (left) at Chowchilla, Ca. in 1993. For nearly 15 years, I was the unofficial historian for the IHBA (International Hot Boat Association). Many of my race stories and photographs appeared in countless publications including; National Race Boat, Powerboat Magazine, Trailer Boats Magazine, Hot Boat Magazine, National Drag Boat and others. I also covered circle boat, K-boat and Unlimited Hydroplane races, and did various work for the APBA (American Power Boat Association). 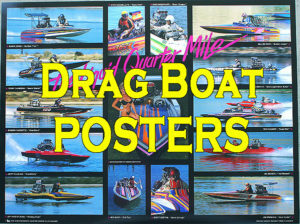 Following the 1986 drag boat season he produced a high-quality full-color drag boat poster, “The Liquid Quarter Mile.” Five years later in 1991 Rick followed it with another classic, “The Liquid Quarter Mile – Part 2.” Both can still be purchased right here on our website. When it comes to your business or professional photographic needs, Rick Cline Photography is just a phone call or email away. Now located in Yuma, Arizona, we’ve been serving our valued clients since 1985. A professional photographer you can count on and trust, a man who will get the job done the way you need it at a price you can afford.